Even if you don’t know their names, those official Olympic mascots are everywhere; Miga, Quatchi and Sumi are winking and waving at you from every store window. Well, it’s high time that our Poverty Olympics mascots got a little more attention. After all, they’ve been working hard at our games for two years in a row, and they’re still way more common in the Downtown Eastside than the fuzzy, cuddly official variety of mascots. Cockroaches are a common pest insect. All over BC, many people who live in low-rent accommodation have to put up with these disgusting creatures climbing over their food, up their walls, into their pipes, and in their beds. Most buildings in the Downtown Eastside have them. Cockroaches eat the food of humans and their pets, and can cause allergic reactions and asthma attacks. However, not all cockroaches are scary; at previous Poverty Olympics we enjoyed munching on a beautiful cockroach cake. While cockroaches ARE pretty creepy, it’s not all bad – they’re one of the hardiest insects in the world and can live for a month without food. Some species can survive without air for 45 minutes! Creepy the Cockroach reminds us of our ability to be resilient. 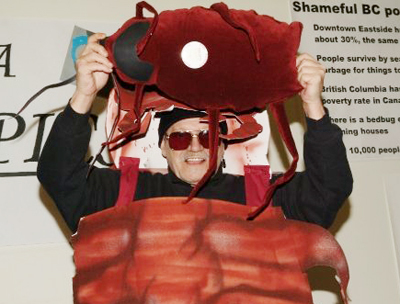 Look for Creepy at the 2010 Poverty Olympics on February 7!